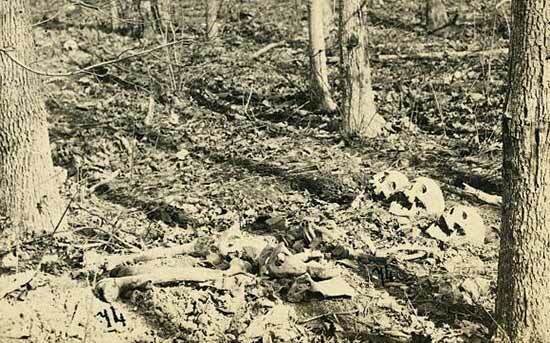 Skull and bones of unburied soldiers along Orange Plank Road in the Wilderness of Spotsylvania, photographed by G. O. Brown, 1864. 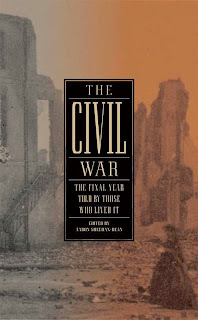 Image courtesy of Civil War Saga. Herman Melville and his brother Allan arrived in Virginia on April 16, 1864, to visit their cousin Lieutenant Colonel Henry Gansevoort— but the soldier was away from base when they arrived. By the time Gansevoort returned to camp, the Melville brothers had departed on a scouting mission in search of the Confederate rangers led by John S. Mosby, whose guerilla tactics plagued Union troops in a region around Middleburg known widely as “Mosby’s Confederacy.” A full five days after their arrival, then, the brothers finally met up with Gansevoort, and they were able to spend less than two days together. During this period General Ulysses S. Grant was amassing his forces for a push against the Army of Northern Virginia, led by General Robert E. Lee. In early May Grant moved his army across the Rapidan River and the two sides clashed in the Wilderness of Spotsylvania, where the ground was already littered with the unburied skulls and bones from the previous year’s Battle of Chancellorsville. By mid-May the action moved from the Wilderness to the crossroads at Spotsylvania Court House. It is, in many ways, a very remarkable document in the history of American poetry, and a remarkable commentary on the moment in American history. . . . In a very profound way it can be said that the Civil War made Melville a poet. . . . [It gave him] the kind of big, athletic, overmastering subject which he always needed for his best work, and it was bloodily certified by actuality. Notes: In Genesis 21, Paran (page 104) is the wilderness dwelling place of the outcast Ishmael. In 1719 Thomas, sixth Lord Fairfax of Cameron, inherited title to more than five million acres of land in Virginia—i.e., Lord Fairfax’s parchment deeds (p. 105). A stanza on page 107 refers to Confederate Lieutenant General Stonewall Jackson’s successful attack against Union forces during the Battle of Chancellorsville (May 3, 1863)—and his death when his own men accidentally opened fire on a returning scouting party.